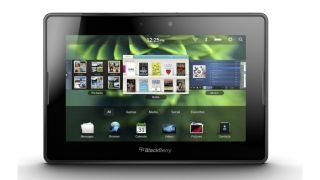 RIM has announced that it has stopped production of the 16GB model of its BlackBerry PlayBook. According to a statement from RIM, the 16GB Playbook will still be available while it sells the remaining stock, but once that's gone you're out of luck. The company says it will continue to produce the 32GB and 64GB models for markets around the world and that it remains "committed to the tablet space". RIM claims that the reason for the decision is that "there is more value for [its] customers in the higher capacity models". Somehow we suspect it has more to do with better margins for RIM on the larger capacity models, but hey – that's business. And business is something RIM needs all the help it can get with at the moment, what with job cuts, restructuring and never-ending rumours of imminent collapse.